A Magnaflow muffler is built with 100% stainless steel. This means you will receive the best construction, which in turn will provide you with excellent durability in even the harshest conditions. Further, the stainless steel mesh can withstand high temperatures and can also reduce the sound, which will leave you with a quiet and smooth ride. Another great feature of a Magnaflow exhaust is their attention to detail. They weld and lap joint all contacts. This in turn ensures there will be no cracks that will appear in the Magnaflow muffler over prolonged use. 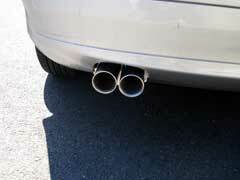 One of the best benefits is the deep tone Magnaflow muffler sounds. They do this by keeping noise to a minimum with acoustical suppression material. This will absorb much of the sound thereby giving you a smooth and quiet ride. Lastly, they stand behind their products. They offer a lifetime warranty on all of their parts, so you can have peace of mind in knowing you are receiving is the best quality. When factoring all of this together, it’s hard to see any drawbacks to a Magnaflow muffler. Even when you consider muffler prices, it’s hard to beat the durable construction and lifetime warranty they offer. When you compare them side by side with other brands like a Flowmaster muffler, you will see they hold their own when it comes to performance and selection. Ultimately, Magnaflow makes some of the best mufflers on the market. They have taken every concern into account when designing their parts, which in turn means you’ll receive top quality equipment that will last and perform well regardless of the conditions. When you buy Magnaflow you can have peace of mind in that you are buying the best in innovation and construction for your ride.